Any rational and objective analyst of India’s water and development policies has to conclude that if the country continues with its past and present practices, the country will face an unprecedented water crisis around 2030, the magnitude and extent of which no other earlier generation had to face. In recent years, the litany of water-related problems facing the country has been like the universe: constantly expanding. Compared to India’s economic and technological developments, especially in the private sector, its water management practices are at least 25 years behind time. Economic damages and social costs due to delays in onsets of monsoons, regular floods and droughts have been increasing steadily with time. In addition, water bodies nearly all major urban centres are already heavily polluted, and getting more polluted by the year. Irrigation management is at best mediocre and certainly way below what the country should be able to accomplish or need. Each Indian budget is a gamble on the monsoon. Even though food, energy, water, environment and poverty alleviation policies are closely interlinked, India has never developed a water policy which explicitly considers its impacts on other sectoral policies and vice versa. In addition, even though water affects the quality of life of hundreds of millions of Indians, the country never had a minister who has been capable enough to understand and appreciate the complexities of water management practices and processes, or stayed long enough to formulate a decent plan and see its implementation since the time of Dr. K. L. Rao in the early 1970s. Successive governments have only given lip service to the importance of water to the country’s social and economic development but their accomplishments have left much to be desired. What the planners and policy-makers have failed to realize is that for a country like India water plays an important part in the lives of all its citizens. If monsoon is late and/or monsoon rains are not enough, food production suffers as does the economic and health conditions of millions of small farmers all over the country. Poor harvests also mean that the buying capacities of the farmers for goods and services are reduced. This is reflected by problems like food price escalation and reduced in GDP growth rates, both of which are likely to happen every year when the monsoon fails. Equally, the country has already faced a power failure which is unprecedented in human history. Nearly 20% of its electricity generation is accounted by hydropower. Reduced water storage in the dams due to poor rainfall often means that hydropower generation is reduced significantly. Equally, the close interlinkages between water, food and energy securities and their direct impacts on the country’s development are neither appreciated nor understood by its planners, bureaucrats or politicians. Policy makers and the public also have not realized the extreme seasonality of rainfall in the country. In much of the country some 80% of annual rainfall occurs in about 80 to 120 hours (not consecutive) during the monsoon seasons. Hence, the main problem the country faces is how to store and manage this enormous quantity of rainfall which occurs within very short periods so that water is available throughout the year for drinking, food production, electricity generation and other uses. The sad state of water infrastructure development in India can be appreciated by comparing water storage capacity available per person in different countries. In USA, it is 6,155 m3, Brazil 2,155 m3, China 2,500 m3: but in India, it is only about 225 m3 per person. Consider the case of Cherrapunji, one of the rainiest cities of the world. The average annual rainfall is about 12,000 mm. And yet, Cherrapunji has been having serious water scarcities in non-monsoon months over at least two decades because of lack of storage structures. While inaugurating the Bhakra-Nangal project, Prime Minister Nehru noted that hydro dams are the “temples of modern India”. During the early 1960s hydro accounted for nearly half of the country’s electricity, which now has come down to about 20%. Had more of Nehru’s “temples” were constructed, India’s power situation now would not have been so dire. Lack of vision of the elected politicians, populist tones of much of the country’s politics, bureaucratic inertia, ineffective water institutions, environmental and social activism, rampant corruption, poor and untimely decision-making have all contributed to the country’s dismal record in water infrastructure development. Not surprisingly, early last year the target for hydro development under the 5-year plan was reduced by 2/3rd, from 30GW to 10GW because of regulatory delays, problems with environmental clearances, land acquisition and chaotic planning practices. These are not new problems: they were all consistently identified as serious constraints under 8th, 9th and 10th 5-year Plans. These problems ensured that barely half of the targets for the power sector have been realized in recent decades. Sadly, no meaningful steps have been taken to resolve these problems. For the 11th Plan, there are already slippages in the targets. This is in marked contrast to other developing countries like Brazil or China which have made enormous strides in hydro development. India simply could not have built the Three Gorges Dam which now provides about 10 percent of China’s electricity because of its inefficient planning and flawed decision-making processes. 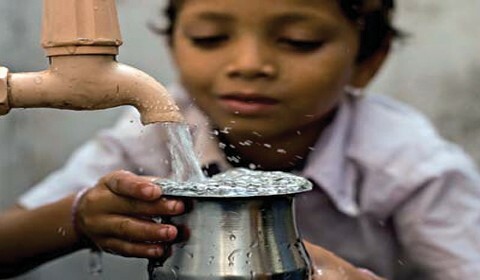 In addition, there is not a single city in India which can provide its inhabitants clean and safe water for drinking on a 24-hour basis, 7 days a week. Yet, there is not a single reason—technical, physical or economic—as to why any Indian city of more than 200,000 population cannot be provided with clean drinking water on a 24×7 basis. Without good infrastructure, India’s water, food, energy and health-related problems cannot be solved. Yet, there is no visible sign that the politicians and bureaucrats have realized the enormity of the tasks the country is facing to develop its water infrastructure in an accelerated manner to meet the future demands of the country. The country certainly has the expertise, capacity and money, but what it lacks are political will, functioning water institutions at all levels, and an enlightened and enraged public totally unwilling to accept the current and sad situation. Also needed is an enlightened media which will hold the feet of the politicians and bureaucrats to fire consistently for this unacceptable situation. Asit K. Biswas is the Distinguished Visiting Professor at the Lee Kuan Yew School of Public Policy, Singapore, and co-founder of the Third World Centre for Water Management, Mexico. Cecilia Tortajada is the co-founder and President of the Third World Centre for Water Management, Mexico.